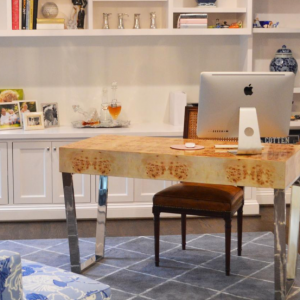 This desk is contemporary in style with clean lines. 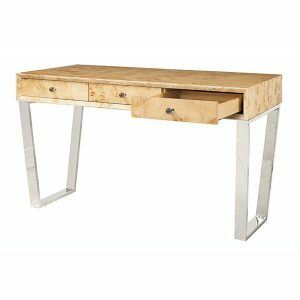 It has metal legs and the Burl wood on the desk gives it a soft natural feel. It is available with Nickel or Brass legs and hardware. 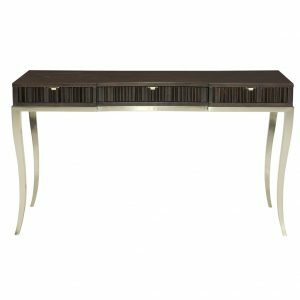 This contemporary desk has beautiful laminated Black Forest marble on top and sides. 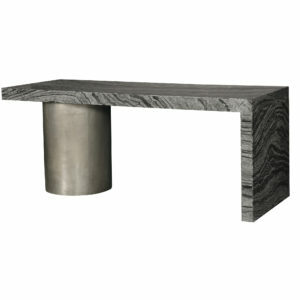 It is held up with a round cast aluminum pedestal that is textured metal in Graphite color. 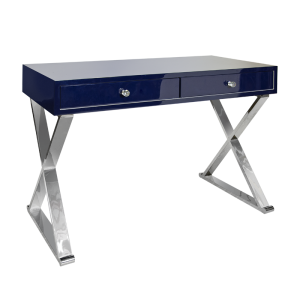 Contemporary style desk has a slight curved front with fluted overlays on apron and drawers. Made of flat cut cherry veneers, with Dark Sable finish and tubular steel base in Argento finish. Has 3 smooth roll out drawers and adjustable glides. Smooth as the calm sea. Lacquered desk has two drawers that glide out. Available in Stainless or Gold Leaf X legs. 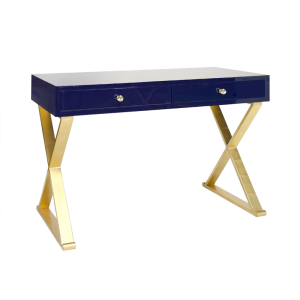 Navy Desk is sold out.